Compared to the hundreds of mythic stories that Joseph Campbell studied in order to develop his structure of the Hero's Journey, the story of Dorothy and The Wizard of Oz is unique. Perhaps influenced by his wife and mother-in-law, L. Frank Baum believed in the rights of women and favored strong female protagonists in his books. Unlike tales of mighty men who began as reluctant heroes only to accept the call to adventure and then find themselves hacking through forests filled with Orcs and goblins to arrive atop a mountain of dead enemies, bloody swords drawn in triumph, Dorothy is a compassionate hero. While the male heroes who populate mythic tales from all times and lands take on the world and bend civilizations to do their bidding, Dorothy only wants to return home. And her longing for home has less to do with returning to the Great Depression–era, black-and-white dustbowl of Kansas and the meager living she might eventually eke out as a farmer's wife than with returning home to save her Auntie Em, whom she believes is heartbroken because of her disappearance. Indeed, every step along the Yellow Brick Road is paved with Dorothy's inner strength, spirit of love, and compassion for others. Unlike many male heroes who might chuckle in triumph while wrenching the valuable ruby slippers from the cold, dead feet of the Wicked Witch of the East—after having first dropped a house on her—Dorothy is horrified to discover that she has accidentally caused the witch's demise. It would never have occurred to the girl to steal the magic slippers. Compassion spurs Dorothy to pry the Scarecrow from his wooden perch and to oil the rusted Tin Man. Love and kindness prompt her to ask her first two allies to join her on the road to meet the Wizard so that they might be granted the brain and the heart they so deeply desire. When the Cowardly Lion attacks her little dog Toto, it is her courage that allows her to defend her tiny pooch with a well-placed slap to the lion's nose. She does not act with a desire to be aggressive or dominate— only with care and protection of her beloved companion. Dorothy solves problems by using her natural, nurturing qualities. Even when faced with the formidable Wicked Witch of the West, it is Dorothy's love and compassion for the Scarecrow, whose arm has been lit afire by the witch, that causes her to throw the bucket of water that puts out the fire and thus accidentally melts the evil creature on the spot. Unlike the male heroes in many tales who steal the boon that allows them access to two worlds, Dorothy is handed the witch's broomstick as a trophy by the Leader of the Guards. She is given the boon freely, in gratitude, because she has freed the soldiers who had been held in servitude by the witch. This idea of a heroine approaching the challenges of her journey in a different way from that of traditional male heroes is another reason why a closer examination of this particular story is so perfect for our present time and situation in history. New ways of thinking are being called forth. The old methods of "conquer and destroy" are ineffective and outdated. Aspects of the Divine Feminine energy are rising up and sliding into more of a partnership with Divine Male energy as our world moves toward a necessary, more ideal planetary balance. Reprinted with permission from Atria Books/Beyond Words Publishing © 2012. 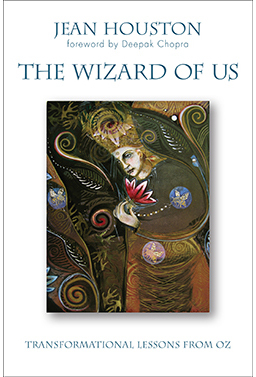 The Wizard of Us is available on Amazon.com.